miss emma. : i saved three lives in under five minutes. i saved three lives in under five minutes. true story, ladies and gentlemen. today my roommate kelsy and i donated blood. i was so so so unbelievably nervous because i heard rumors of people passing out and about how they draw an obscene amount of blood and i literally forced myself into doing it. when i get nervous, it is really noticeable and embarrassing and today was no exception. for instance, before i took my first drivers test when i was sixteen, i got my windshield wipers confused with my blinker and i drove with my emergency brake on. needless to say, i failed. my nerves get the best of me. and before i got my wisdom teeth out, i was so nervous i bitched out the nurse trying to put in my iv for being rude to me. my poor mom was so embarrassed for me. i'm sorry i'm a sass. lately i've been dealing with my nervousness in a new way...i laugh uncontrollably or just talk the ear off of anyone who will listen to me. so that's what i did. the girl before me who was in the process of getting her blood drawn as i was waiting, passed out. all the technicians rushed to her and fanned her and gave her water and i just sat next to her watching and i got really uncomfortable so i just started laughing. it wasn't funny at all but at the moment i couldn't think of any other reaction, considering my hesitations about volunteering myself for pain. so after this poor byu girl regained her consciousness, it was my turn and i couldn't laugh anymore because the lady told me not to move my arm so just started talking. we talked about how uncomfortable it is to see exboyfriends with new girlfriends but how great it is when the girls are ugly and she was so impressed with my great health and how well i filled up that bag full of my precious blood. apparently i have perfect veins too, thanks to the several smart waters i consume everyday. anyway, at the end of my session, i felt so accomplished and proud of myself for conquering my nervousness and donating to such a great cause. that one bag of blood i filled in under five minutes can potentially save three lives. that is a miracle. medicine is a miracle. ps. the above picture is of my elbow wrapped in gauze post-donation. 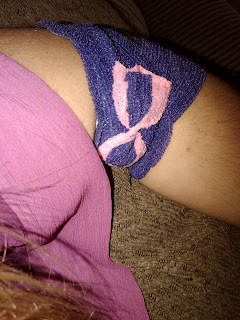 the nurse lady liked me so much she made me a little bow for decoration. i loved it. even though i was woozy and light headed all day. totally worth it.